Windows 10 version 1803 has reached users at the fastest rate in the history of the Windows 10. A new report points that the latest stable build has been installed on 50 percent of the Windows 10 devices in a month since its release at the end of the last month. 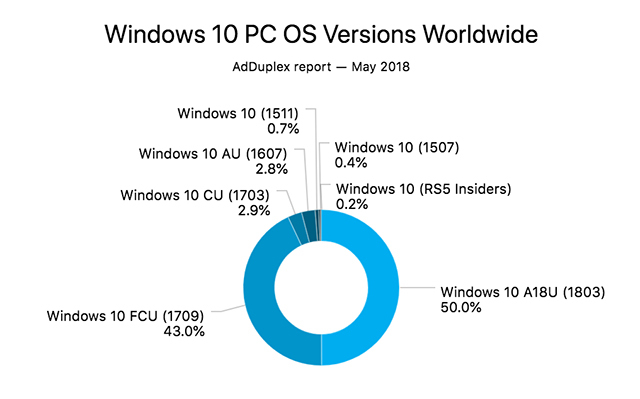 AdDuplex, an advertisement analytics company focussed on Windows, revealed that this is by far the fastest roll-out of Windows 10 update. Comparatively, Creators edition (build 1609) took three months to achieve the same adoption rate, while Fall Creators edition (build 1709) took two months. The last two major updates came without any major bug and that is likely to be what might have prompted the users to install the latest update. But as far as this build is concerned, there is not much clarity about what could have led to the speedy distribution, especially when a slew of users reported their peeves with the update. While many users were unable to install – or even download – the update, others had to face the issue of disappearing desktops. The problem was later addressed by Microsoft as being caused due to Avast antivirus, and a fix was rolled out only last week. there is a likelihood that Microsoft was bullish on getting more users to update to the latest build, but it should have done so by giving valid reasons. Forcing updates on users is something the company has been blamed for before. AskWoody (via TechRadar) also points out that Microsoft could be forcing users to update their Windows 10 PCs to the latest update even if automatic updates are turned off on their machines. It noted reports from several users who were unable to defer updates, even when they had opted for semi-annual or annual updates only.